Buy yours today and make exciting discoveries. Construct and manipulate the following solid geometry objects: points, lines, line segments, rays, vectors, circles and conical sections, planes, triangles, polygons, spheres, cylinders, cones, polyedra, transformations, etc. Clarify and organize your construction using the numerous graphic attributes available (colours, textures, styles). Freely move the viewpoint around your construction, and simultaneously display any number of projections (from a choice of over 15 standard projections). Organise these views on one or more pages, adding comments (rich text). Print or capture high resolution documents. Export your documents as interactive figures to Windows applications and web pages (free Windows plug-in). 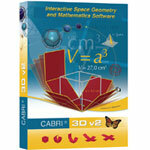 The revolutionary new version 2 now lets you measure length, area etc and see equations of objects. Integrate numeric data using new measurement and calculation tools. Manipulate and animate, rotate in space and reshape with simple mouse movements. Print foldable nets of 3D objects. Free training videos and resources. Use the replay construction function to check actual steps students used. Windows 98, Me, NT4, 2000, XP or Mac OS X version 10.3 or higher. Allows use by one single user. Extended Site Licence permits use throughout one single geographical site and use at home by all staff and students. �750 + vat includes first year of off-site use. Second and subsequent years = �235 + vat per year.